There is a trail not far from the city described as a natural masterpiece where shitake mushroom collectors and char-coal burning farmers once wandered. The Saryeoni Forest Path reaches from Jeju City in the north to Seogwipo in the south, calling hikers to a peaceful wood-land stroll. The rainy season has started on Jeju and the weather is unpredictable at times. The day I went to Saryeoni was foggy and wet in the city but driving down the scenic Bijarim Road (1112) to the forest path entrance, I could tell it was going to be a beautiful day. When I arrived at the trailhead, I couldn’t imagine a better time to come. The trees glowed green and the mist gave a mysterious enchantment to the forest. This new trail is actually old access roads turned into a pleasant walking path. The road is nearly flat the entire way with virtually no grade so is accessible to almost anyone. Much of the trail has been repaved with fine-grained red gravel that is easy on the feet and pleasing to the eyes. Stretching 16 kilometers from Mulchat Oreum to Saryeoni Oreum, the path is wide but enclosed by the temperate forest canopy. Kang Mann Saeng, chairman of the Jeju Saryeoni Forest Experience Committee, said that the trail provides an alternative to packaged sightseeing tours. It is “a new ecology experience and (provides) a new ‘healing’ product which brings Jeju tourism to a new level,” he said. As I approached the base of Mulchat Oreum, there were two staff members waiting at the trailhead. My original feeling was one of disappointment as they informed me that the summit of the oreum and its beautiful crater lake are closed for the remainder of 2010. I noticed that one of the staff members had a binder of sheet music. Trying to make the best of the situation and being an avid musician, I asked if he would play a song. Surprisingly, he was not shy at all and pulled a strange-looking instrument out of his pocket. 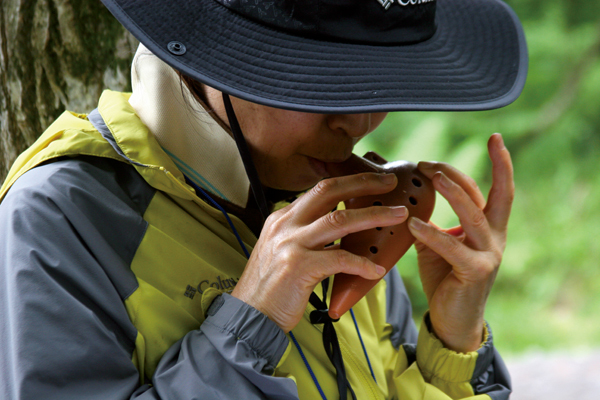 The instrument was an ocarina, much like a miniature, round flute. Halfway through his song, his partner pulled her own ocarina out of her pocket and harmonized to the traditional Korean song. The song was peaceful, a smile grew across my face and my disappointment soon evaporated as I realized that there are other ways to enjoy the forest. I can let the oreum rest and regenerate until next year. After Mulchat Oreum, hikers reach a crossroads from which you can go east to Bulgeun Oreum, west to the Seongpanak trailhead of Mount Halla or continue south to Saryeoni Oreum. The beautiful red path changed to a gray concrete and gravel road, but the forest still glowed. Japanese cedar trees are familiar sights on Jeju where they are often used as wind breaks in the tangerine fields. According to a brochure I was given, Japanese cedars were originally planted around the hills and mountain areas of Jeju as part of a reforestation project. The stand of trees in the Hanman Research Forest is the oldest group of cedars on Jeju. Planted in 1933, these trees are already nearly 30 meters tall, making them giants by Jeju standards. The trees provide as much of an old growth and dense forest feeling as any I’ve experienced in Jeju. After nearly 16 kilometers of walking on the flat road, I finally got to the base of Saryeoni Oreum where the path led up a tight ridge on the northern side. Soon after starting up, the steps give way to a more traditional dirt trail. The forest was so thick that I had to duck around trees at nearly every step. At times, the foliage was so dense that even in mid-afternoon, it was as dark as twilight. Unfortunately, the mist made for a whiteout at the top with no view, but there is a newly constructed observation platform that would provide a full view of the southeast corner of Jeju Island on a clear day. 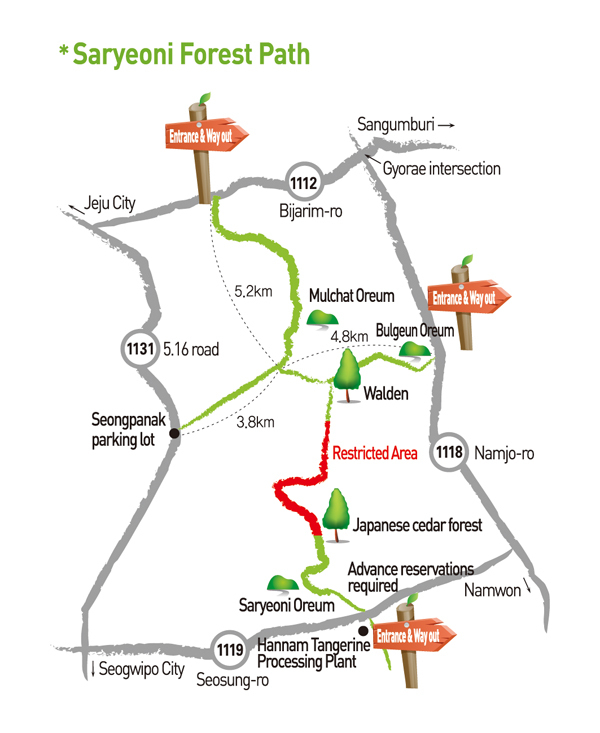 The path to Saryeoni from the cross-roads is on Korea Forest Service land, so it is only open during a yearly promotional period from June 12 to 27. Outside of that time, Saryeoni Oreum and the Japanese Cedar Forest can be accessed by reservation only by calling 064-730-7272.